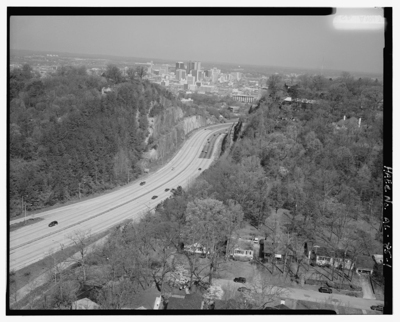 The cut in Red Mountain, finished for the expressway in 1971, might tell Birmingham’s stories between layers where rusted hematite meets our vision. My mom drove me through this cut many times, between downtown and the suburbs I grew up in, to visit my dad at his office or to pick up my sister from dance classes. My dad tells me that when he was a child, that had to go over it to see his grandparents in Tennessee. There are shared stories too, of Birmingham’s formation in the place where the railroad passed seams of limestone, coal, and iron ore. While economies are common, they’ve never been truly shared. This space insists we remember how people and wealth moved over the mountain, to develop new cities and new school systems, after the progress of the Civil Rights movement. Much older stories are told on these oxidized faces. At least 160 million years worth of rock reminds commuters that ocean’s recede and that species live, die, fossilize, and may one day be rediscovered. James says that rust will be brought as evidence against the rich. As evidence, it is extensive—geologic, economic, and chemical. It gathers in sink drains, on industrial infrastructure, and even in mountainsides. Like moth holes and rot, it witnesses to the decay that causes the wealthy to weep and wail. For James, these material forms of decay cannot be separated from the economic choices of the wealthy. Such rust is inevitable when landowners keep back wages, when economic power is leveraged to force others to sell or give up their land, and when death upholds wealth. And yet, we know practices of attention and care guard against rust. This is why we clean, dry, and season cast iron skillets right after use. It’s the reason we work in a layer of oil before putting them away. And when rust does show up, we scrub the pan clean. • Where in our community do you see rust and other forms of decay? What social and economic choices are responsible for it? How are these experiences of oppression and exploitation witnessed in our community’s geography? • How does our community of faith care for those who are poor and oppressed? • How does our community of faith relate to wealth? • How might our communities of faith and our larger communities embrace James’s call to cultivate the precious crop in a way that resists both wealth and poverty? Here the cries and tears are not those of the humble penitent, but the distress of the wicked in the face of their imminent condemnation (cf. Isa 13:6; 15:3; Amos 8:3). This echoes the motif of the woes of the rich at the reversal of their fortunes at the eschaton, which we also find in Luke 6:24-25: “But woe to you that are rich, for you have received your consolation, Woe to you that are full now, for you shall hunger” (cf. 1 En. 94:9-11; 97:8-10). The perfect tense of the verbs (“have rotted,” “have been moth-eaten,” “have rusted”) in vv. 2-3a, easily gives way to the future tense (“will be evidence against you,” “will eat”) in v. 3b, expressing the prophetic anticipation of things to come (Dibelius, 236). These verses should not be read, therefore, as a description of the state of the world market at the time in which James was writing, but as proleptic prophecy of what will ultimately happen to all material wealth. Marie E. Isaacs, Reading Hebrews & James: A Literary and Theological Commentary, Reading the New Testament (Macon GA: Smyth & Helwys, 2002), 235–36. James has already alerted the oppressed to the end that awaits their tormenters (5:6); earlier James has encouraged the struggling with the promised reward that awaits those who withstand the test (1:12). Though a hostile or indifferent world cannot see it, “the oppressed community of James knows that its difficult situation is in favor of those who suffer.” God will exalt the lowly and bring down the mighty (1:9-10); already, God opposes the proud and graces the humble (4:6). Therefore, James urges his beloved community to take the farmer as an example of that “waiting” James has in mind. It would be a strange farmer indeed who having planted a crop did nothing but wait until harvest; true, the farmer is dependent on God’s good gifts of rain but such faithful dependence does not translate into inaction in the between time. This is clear from James’s second call to “be patient” (5:8) which is clarified as “strengthen[ing] your hearts”; the ‘patience’ James refers to demands courage. The warning against grumbling (5:9) at first seems out of context, though James is admittedly sensitive to sins of speech. This caution echoes the stern prohibition against speaking evil of community members (4:11-12). Together these two calls to bridle the tongue frame James’s denouncement of the presumptive, profiteering merchants (4:13-17) and of the fraudulent, violent land barons (5:1-6). The crisis situation in the beloved community— some suffering at the hands of the rich (5:1-6), others catering to the rich and betraying the community’s poor (2:1-4)—perhaps explains James warning. The threat is that external oppression and internal hypocrisies will shatter the faith family’s unity. Or perhaps the tension is over the right tactics in the struggle for the right. Should those single-mindedly committed to work for justice look for a confrontation? Or should they lead quiet lives of doing what is right but stand firm if a fight finds them? Edgar V. McKnight, Hebrews-James, Smyth & Helwys Bible Commentary (Macon GA: Smyth & Helwys, 2004), 405–7.